Hot off the press! New from Xikar, the unique Turrim. Look for a detailed , hands on review coming shortly! UPDATE: See my new full review of Turrim here! XIKAR designs newest tabletop lighter to stand proud on any table but humble enough to pack in travel case. Kansas City, MO – February 10, 2015 XIKAR, Inc. proudly announces a breakthrough in lighter innovation with the 5x64 Turrim. This new double jet flame lighter introduces groundbreaking features showcased in a unique shape novel to the cigar industry. 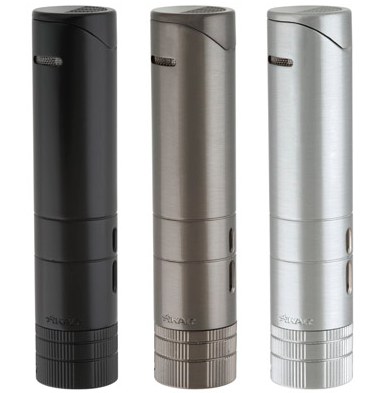 The 5x64 Turrim features the largest fuel tank offered by a XIKAR lighter, encompassed by a durable metal body. Its tall and cylindrical shape is ideal for the smoker on the go, fitting perfectly into a cigar slot in your travel case, or standing alone as a reliable tabletop lighter. The patented ratcheting fuel adjustment system transmits the power of the lighter to your fingertips as the flame is adjusted to the preferred height. This one-of-a-kind lighter stands immaculate in black, G2 and brushed silver finishes. “With the 5x64 Turrim, XIKAR introduces a lighter truly unique to the cigar industry.” said Kurt Van Keppel, CEO and Founder of XIKAR. “It fits perfectly into your cigar travel case and provides 20% more fuel capacity than previous tabletop lighters from XIKAR. With just the right amount of flame power, the 5x64 Turrim embodies the perfect table or travel lighter for any cigar enthusiast” continued Mr. Van Keppel. Questions regarding this announcement can be directed to Kurt Van Keppel, CEO or VP of Sales and Marketing, David Frazier. I purchased this lighter as soon as it came out. Love the size and the dual flame. That said I have to return it already for servicing after about 2 months of use. Its taking a dozen tries to get it to fire just once. Because of the large adjustment knob on the bottom when you hold it you have a tendency to adjust it when you don't want to.